Knowledge Leader Spotlight: Will Shionogi's R&D Machine Outrun The Flu? Will Shionogi’s R&D Machine Outrun The Flu? In the midst of the worst flu season in a decade, Japanese pharmaceutical company Shionogi & Co., Ltd. is making headlines for a new drug it says can kill the influenza virus in 24 hours with a single dose. Today, only a handful of treatments exist for the flu, including the #1 flu drug Tamiflu, from Roche AG, which must be taken twice a day for five days. 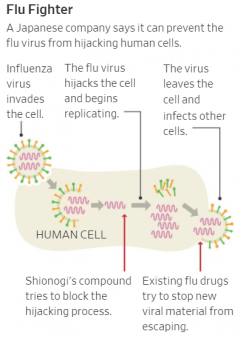 Shiniogi says its new drug — called Xofluza — offers faster relief from flu symptoms by preventing the virus from taking over human cellular machinery. Tests resulted in patients recovering more quickly than with Tamiflu. In addition, the firm believes Xofluza also could help reduce the spread of the virus as a result of shorter illnesses leading to fewer exposures. Due to this year’s lethal flu season and the disruptive nature of the drug, Japan’s health ministry fast-tracked approval of Xofluza, approving it last month. The pill was launched in Japan last week, and Shinogi is seeking FDA approval in U.S. which the firm expects sometime in 2019. Roche already has acquired the license to sell Xofluza internationally, including in the U.S.
Shionogi firm began R&D on the flu drug more than a decade ago, when it was working on drugs to treat HIV and high cholesterol and wondered if its discoveries in those areas could be applied to flu treatments. Another highly anticipated innovation from Shionogi is a drug to treat multi-drug-resistant bacteria, for which the firm announced promising test results early this year. New drugs still in the pipeline include treatments for ADHD, pediatric dust mite allergies and chronic liver disease. Frontier developments in Shionogi’s labs include treatments for four different kinds of cancer, obesity, diabetes and Alzheimer’s. Last year Shionogi announced Symproic, a treatment for opioid-induced constipation, had been approved by the FDA and is now available in the U.S. Founded more than 140 years ago, Shionogi began as a distributor of Eastern medicine, but upon discovering medicine’s growing power to save lives, switched to Western medicine, and invested in innovations in pharmaceuticals, according to a company video. Its first successful product was an indigestion drug in 1909. Based in Osaka, Japan, Shionogi currently targets two therapeutic areas: infectious diseases, and pain/central nervous systems disorders. New research areas include obesity/geriatric metabolic disease and oncology/immunology. Our proprietary process of identifying Knowledge Leaders corrects for a 1974 accounting ruling requiring firms to expense all innovative investments in the period in which they are incurred, which has given rise to a steady deterioration in the information content found in financial statements and an actionable market mispricing anomaly. To correct for this ultra-conservative accounting stance, we identify and capitalize innovative investments R&D, brand, IT, human capital development, and organizational capital for roughly 5,000 companies across the developed and emerging markets. In order to be included in a Knowledge Leaders Index and considered for our active or passive portfolios, companies must meet a set of specific criteria, including possessing a high level of intellectual property capital, high levels of profitability and lean balance sheets, all reflective of a firm executing a successful innovation strategy. Shionogi & Co., Ltd is included in the Knowledge Leaders Indexes.